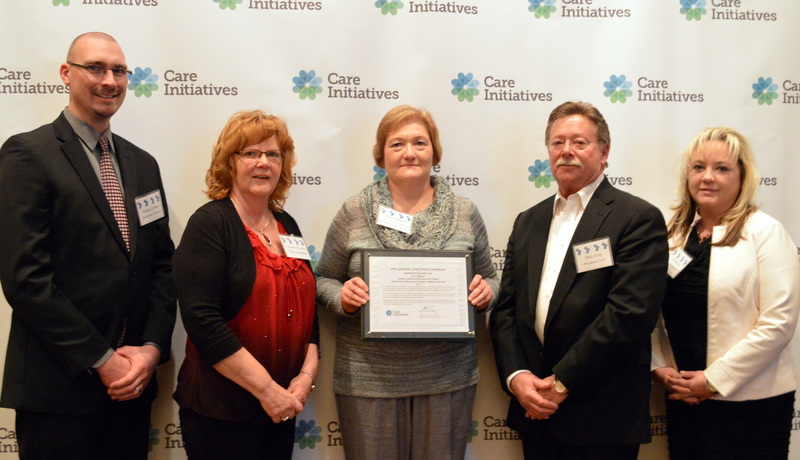 Pam Galbraith of Ravenwood Specialty Care in Waterloo received Care Initiatives Outstanding Social Services Coordinator for 2015. She has been with Ravenwood for 33 years. Administrator Lori Bellinger says that Galbraith is always putting others first. “Whether you are a resident, a family member, a community member, a health care provider or a team member, Pam will try everything in her power to get done what is needed,” Bellinger says. Ravenwood Specialty Care is a 196-bed skilled nursing facility offering rehabilitation services, skilled nursing care, long term care, and hospice care. It is owned and operated by Care Initiatives, Iowa’s largest not-for-profit senior care provider. With headquarters in West Des Moines, Care Initiatives and Care Initiatives Hospice operate 56 skilled nursing care, rehabilitation, Alzheimer’s/dementia, assisted living and hospice locations throughout Iowa. For more information about Care Initiatives, visit careinitiatives.org or call 319-232-6808.